Many people think Italy is the worst place to be gluten free, but it was surprisingly easy. We traveled to Italy for Easter weekend, arriving in Rome on Friday night and departing early Tuesday morning. We managed to visit Naples, Pompeii, Sorrento and Capri in three days. While we changed location every day, we did manage to see (and eat) some amazing things. Here are my tips on what to see and eat on a gluten free Italy trip. After a horrible night in a crappy hotel near Rome’s Central train station (Roma Termini), we left Rome Saturday morning by train. We had gone back and forth on whether to add Naples to our already busy agenda of Pompeii, Sorrento and Capri. We made a last-minute decision to stop there for lunch after meeting a lovely Italian girl in line to board our plane the day before. She recommended her favorite three pizza places in Naples. I consulted Yelp and determined that one of them had gluten free pizza, and the trip was on. 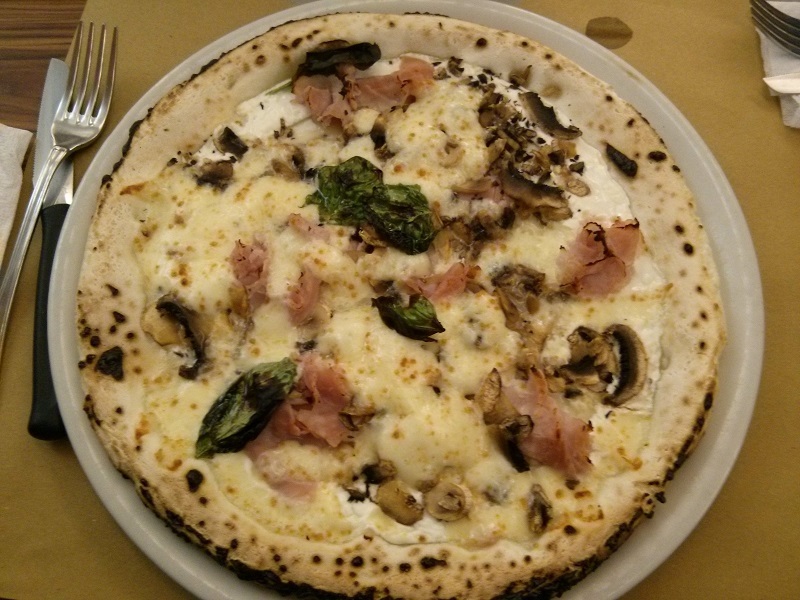 Marcantonio pizza on a gluten free base at Sorbillo in Naples, Italy. We took a train from Rome to Naples and then walked from the train station (Naples Centrale) to the city’s historical center (Centro Storico). There along Via Tribunali we found the Sorbillo pizza block. There are three restaurants lined up: Gino Sorbillo is the biggest and most famous place at Via de Tribunali 32. The smaller place on the corner is Antonio e Gigi Sorbillo. At Via de Tribunali 38, it’s owned by cousins in the Sorbillo family as well. This is the one that has the gluten free pizzas. In between the two you’ll find a small place offering fried pizzas, but nothing gluten free. We arrived at noon to find out that the corner restaurant didn’t open until 12:30. At that point, there was just one group in the queue, so we figured we’d walk around and come back just before opening. We arrived back at 12:20 and found a massive line at the door. Well, “line” is an overstatement – it was kind of a mob! We joined what looked like the logical place at the back and waited. At about 12:35, the doors opened and the mob began pouring in. The inside of the restaurant is small but they’ve crammed an amazing amount of tables and chairs in there – be prepared to be up close to your neighbors. We did actually get in the restaurant in the first run of seating, so by 12:45 we were ready to order. They are clearly used to lines down the block, as they were cranking out pizzas at impressive speed. I ordered a gluten free Marcantonio, which included ham, provolone, mushrooms and cream sauce. Legend got the gluten base with fried eggplant. They were both really good pizzas. The gluten free one was thin-ish, but had a bit of a chewiness to the crust. My guess would be that it used a fair amount of tapioca flour in the mix. The toppings were lovely and I pretty much destroyed that pizza. It was our best meal for the whole trip. Two pizzas (one with a 1.50€ supplement for being gluten free) and two Cokes set us back 21€. We would pay twice as much for way less later in the trip, so this was really a pretty good bargain. If you go: get there at 12:15 to join the line, or be prepared to wait a while. The line was even longer when we left after our lunch! Note that they, like many Italian restaurants, close between lunch and dinner, re-opening around 7pm. After lunch we headed back to Napoli Centrale, grabbing a gelato on our way from a random shop just off Via Tribunali. We went downstairs from Napoli Centrale to reach Garabaldi Station, and bought tickets for the regional train (Circumvesuviana) that would take us to Pompeii and Sorrento. 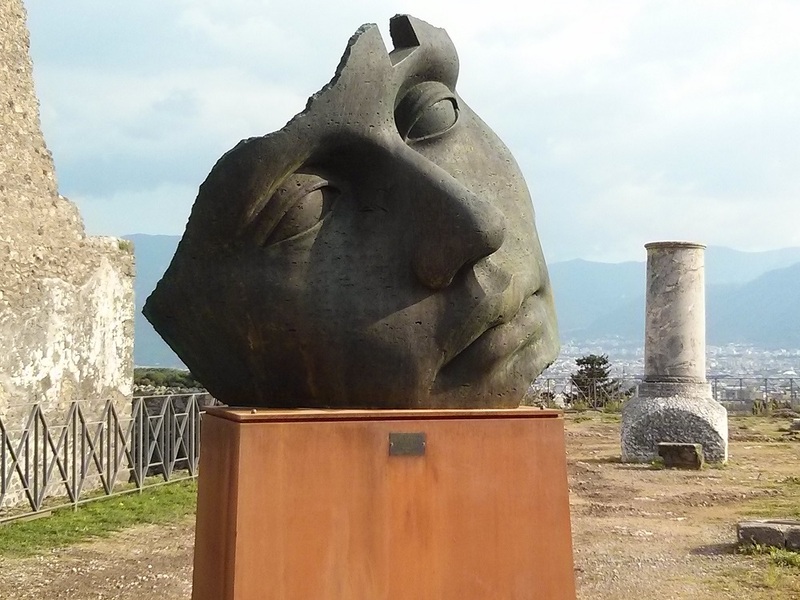 Cool things near the entrance to Pompeii’s ruins. After about a half hour train ride, we reached Pompeii. There are two Pompeii train stations – the ruins are at Pompeii Scavi. If you go, be careful to board the right train! The bad thing about our Naples side trip is that we got to Pompeii at 3:20, and they close the doors to admission after 3:30. We made it (just barely) but then had really limited time to explore as we had to be back at the bag check at 5. We didn’t have time to rent audio guides or even consider a tour, and off we went without so much as a map. It turns out, there’s not really any information posted around, so we have no idea what we saw. It was pretty cool to see without context, but if I had it to do over, I would have arrived a few hours earlier and looked into tours or guidebooks. We found a map on the ground about halfway through and this is where I made a massive error. I saw one exit on the map and led us there. Well, there were two exits and the one I picked was 15 minutes from where our bags were. We reached the exit at 4:50. We had to run (well, Legend ran, I couldn’t keep up) back to the other exit to get our bags back. He got there at 5:03 and caught the bag claim lady as she was about to lock up for the night. He got our bags back as I got lost on the streets of not-ancient Pompeii. Since we had approached from the other direction the first time, nothing looked familiar. Eventually I found the car entrance and followed the road up the hill until I reached the main entrance and found Legend standing there, bags in hand. 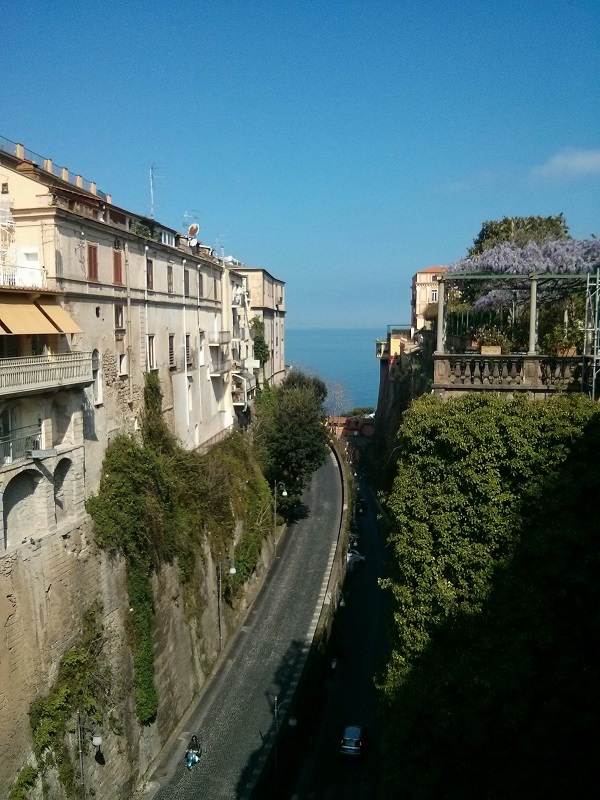 We walked back to the train station and boarded a very crowded train for Sorrento. The view from Sorrento down towards the marina. You reach the marina via a long flight of stairs and a short walk. After arriving in Sorrento, we checked in to our bed and breakfast (which ironically didn’t include breakfast unless you paid more!). After a little rest and clean up, we set out to Sorrento’s Piazza Tasso, the main plaza in the city center. We walked around a bit trying to decide what to have for dinner. I’d done a little research and had a few places few bookmarked on Yelp that were gluten free-friendly. We stumbled upon one of them, Ristorante S. Antonio, so inside we went. You go up a flight of stairs and find yourself in this big garden filled with citrus trees and tables. It was cold, so we went to the indoors part (right in the middle of the garden.) There was only one review on Yelp but she had said she had gluten free pizza there. As I’d had pizza for lunch, I was looking for something different. They didn’t have gluten free clearly labeled on the menu but I asked and they said they had pasta available. I ended up ordering risotto with shrimp and lemon instead. I think Legend was happier with his meal (grilled artichoke starter, and I can’t remember his main but I think it was pasta) than I was. Mine was fine, but I’m not a big fan of shrimp, and I found the texture a bit gritty and off-putting. The rice and lemon bits were really nice so I finished all of that. I wouldn’t say it’s a must-do, but it’s a safe option in Sorrento. After dinner we wandered around a bit more and stumbled upon Puro, a gelato shop near the piazza. The guy working the gelato counter was awesome and super friendly, and helped me with lots of gluten free options. He was careful to use a clean spoon to dish my gelato too. This one I’d recommend you visit. We’d had a pretty epic day of travel, so we were exhausted and ready for bed. After a long night’s sleep, we had a really crappy breakfast in the morning and headed down to the marina via a giant staircase. We waited about 20 minutes to buy our ferry tickets, but the ferry was delayed because of the line so we ended up getting right out on the next boat to Capri. 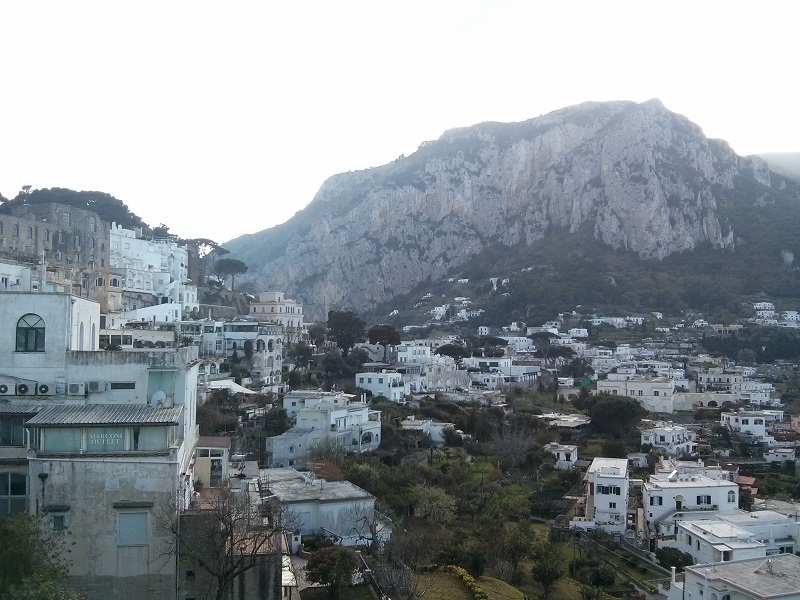 The view of Capri from near the funicular platform. We arrived at Capri at midday on Sunday. 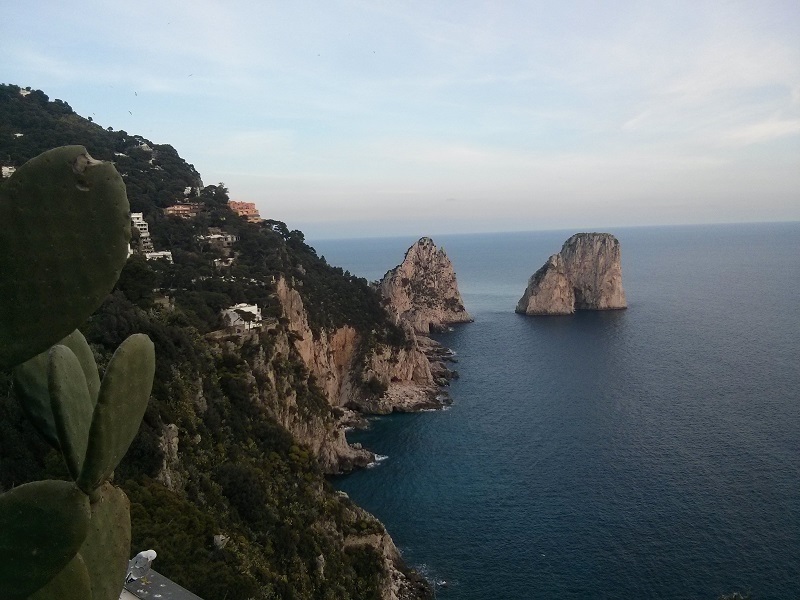 (Pro tip: take Dramamine before you get on the fast ferries to/from Capri – they are not gentle.) After fighting our way through the throngs of people on the docks in the marina, we reached a tourist office. They gave us a map but really couldn’t tell us anything. We then headed around the corner to the right to reach the bus stop and joined the line waiting for the Anacapri bus. Since cars aren’t allowed to be taken to Capri, they have a pretty good bus system (and a funicular from the marina to Capri town.) It’s cheap too at 1.80€ each ride. They are small buses and ours was completely packed – we stood for a harrowing ride on narrow, twisting roads. We left the bus at the Anacapri’s Piazza Vittoria. Our hotel for the night was just a short walk from the piazza. This was not quite halfway down the Phoenician Steps. You cross under the road and keep stepping. Don’t know these guys hanging out on the steps. Photo by Legend. We checked in and consulted our map to decide what we’d do next. We had planned to do a boat tour in the morning, including a visit to the Blue Grotto, so we just wanted to explore what we could on land for the afternoon and evening. We had a quick lunch in Anacapri and then set out on our walk. 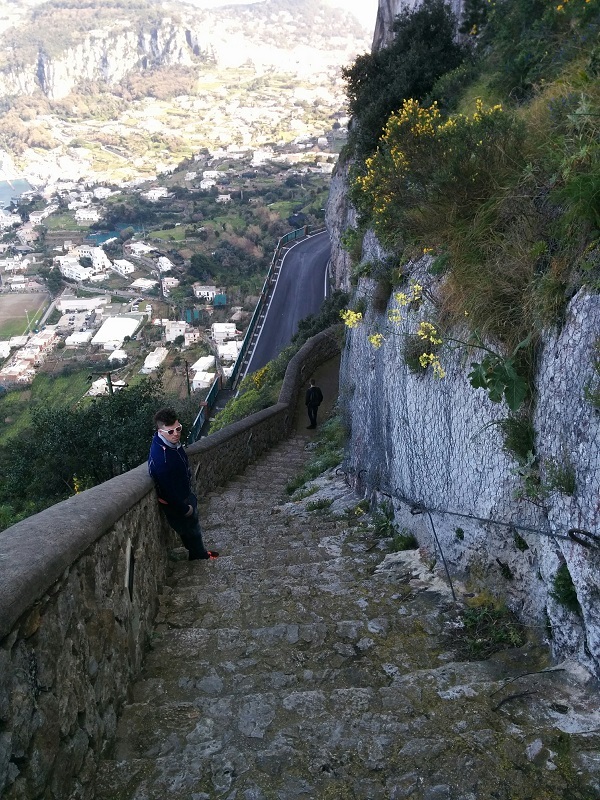 We decided to check out the Phoenician Steps, a 921-step stairway that used to be the only way from Anacapri to the Marina. People used the steps to make water runs, carrying fresh water all the way up the steps to Anacapri. We took the steps down from Anacapri, ending at the Marina Grande. I learned later that they recommend you take them up, not down. Yeah right! My calves were sore for almost a week, though, so maybe this is a suggestion for a reason. After a quick gelato break in the marina (not very good, one of the tourist traps just where you arrive on the ferries) we took the funicular up to Capri town. Capri is filled with fancy shops, and it’s clear it’s where the rich come to play. We didn’t really do much shopping, other than browsing a few souvenir shops. Instead, we followed our noses to Gastronomia di Buonocore Raffaele, the home of the best gelato we ate on our trip. They serve gelato out of the front window of the shop (which contains a bakery too), and they make their waffle cones fresh on the spot. You can smell the cones for blocks! Unfortunately, they don’t make gluten free cones but they do have some store-bought cones on hand. I noticed they unwrapped my cone when I ordered and used a clean spoon to dish my gelato, so they seemed very aware of the dangers of cross-contamination. If you go to Capri, plan to make a stop (or three) here. The view of the Faraglioni from Augustus Gardens on the south side of Capri. From there we headed south to the Augustus Gardens, a lovely maintained garden with spectacular views of the Faraglioni rock formations in the sea. There’s a 1€ admission charge per person that is totally worth it. From there, we had planned to keep going on Via Krupp but it’s closed in 2016 due to the danger of falling rocks. Plus after I saw how steep it was, I don’t think I could have handled it in the same day we did all those stairs. We turned around and went back into Capri for dinner. I’d done my research and chose La Capannina Dea for its gluten free and vegetarian options. This was our priciest meal, but as we were celebrating Legend’s birthday that weekend, I wanted to take him out for something nice. We were seated in a near-empty restaurant, which was a little weird. It was Easter Sunday and it was about 7:30, so I’m not sure if it was just an odd day and time or what. We were handed menus with the day’s specials clipped to the front. I asked about gluten free and was told they had spaghetti and fusilli available, along with gluten free bread. They brought me a couple of slices of bread (looked like store-bought sliced sandwich bread) and Legend got the full gluten bread basket. I ordered a Caprese salad starter and gluten free fusilli with mushroom sauce for my main, and Legend ordered fried zucchini blossoms (not gluten free) and the same mushroom sauce I picked, but with homemade, gluteny pappardelle pasta. We also shared the house red wine. This Caprese salad was so good. Our food was really good; not incredible, but very nice. 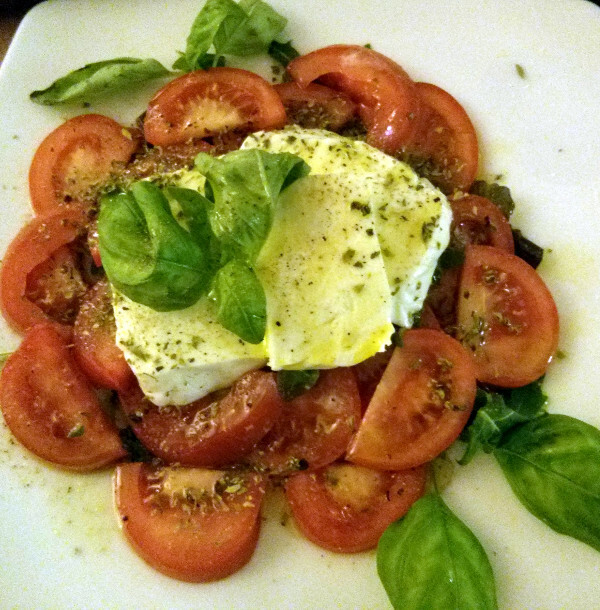 The Caprese salad was the best one I had on the trip (and I had several.) The pasta dish was good but I would have liked more sauce. 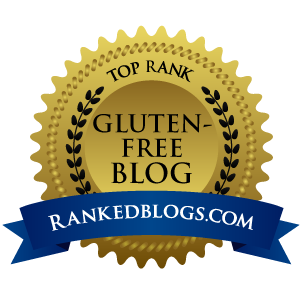 The service was really good and they were very knowledgeable about gluten free. I felt very taken care of there, which as anyone dining with food sensitivities will know means a lot! Our whole meal (two starters, two pastas, a carafe of house wine, a bottle of water and Legend’s espresso) came in at about 70€, which included a cover charge and 10% service charge. We stayed on the cheaper side of the menu, but with meat and fish dishes this place could get very expensive very quickly. Still, they claim to be a celebrity favorite and have walls plastered with pictures of the famous people who have visited – I was sad not to spot anyone famous but then, I didn’t really see anyone at all until we were leaving. After dinner we were full and exhausted, so we took another sketchy bus ride back up to Anacapri and called it a night. The next morning we awoke to steady drizzle, which meant our plans for a boat tour were squashed. We opted instead to explore the shops of Anacapri near the piazza and picked up a few souvenirs. We started the day hoping the weather might clear up, but it actually just got worse, breaking into a full rain by midday. We decided we’d head back to Rome early and try to have dinner there, with a little time to walk around and explore and finish our souvenir shopping. Oh, how optimistic that was! We grabbed our bags and took another bus down to the marina, where we thought we’d catch the next ferry out in about 40 minutes. Well, that one was sold out and we had to buy tickets for the next one, almost two hours later at 3:25 pm. We checked our bags in at a nearby souvenir shop and walked down the marina for lunch. We picked L’Approdo for its offer of free WiFi. They do have gluten free pasta, but my lemon cream spaghetti was overcooked, mushy, and not very flavorful. It’s a safe option but I’m sure there are better options out there. This Circumvesuviana regional train was covered in graffiti. The difference between regional trains and fast trains is huge, in both speed and comfort. Finally we were able to get on the ferry for Naples, and after about 50 minutes we reached the port in Naples. 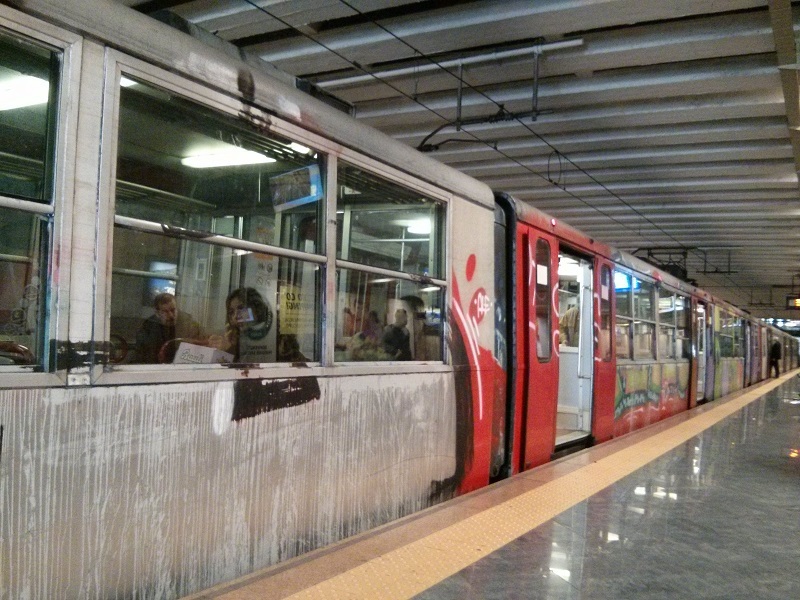 A short walk and metro ride put us in the Naples train station just before 5 pm. Fast trains to Rome only take an hour, so we still thought we’d have time for dinner in Rome before heading out to our hotel near the airport for our early flight. Wrong again! All the fast trains were completely sold out and our only option was a three-hour regional train with no reserved seats that left at 6:40 pm. Our dreams of Rome (and dinner) were officially squashed, and now we knew we’d have to be strategic about getting our butts in seats on that train. We ate a quick, crappy meal in the Naples train station and headed over to the platform at about 6:10. On a whim, I suggested we see if the train was already there and IT WAS. We hauled over there and got on the train, finding two forward-facing seats with space for our bags. SCORE! We settled in for a long ride in a very full, very smelly train with the world’s most disgusting, urine-covered bathroom I’ve ever seen. We reached Roma Termini at 9:30, switched to a train for the airport that left at 10, and finally got to our hotel just before 11 pm. The hotel had a restaurant so we decided to eat again (my train station meal had been a salad with mozzarella, really no protein or substance to it and I was starving.) It was midnight when we reached the room and we both still had to shower and re-pack for our flight out in the morning. Did I mention our international flight left at 7 am, so we had to be there to check in at 5 am? So yeah, we got about 3 hours of sleep. It felt like such a waste of a good hotel room, especially after spending the first night in an awful place. The gluten free section in the pharmacy was amazing! I discovered a few things about navigating Italy while gluten free that I found really helpful. First, “gluten free” is “senza glutine” (GLOO-tin-eh). If you want to buy gluten free groceries, you actually need to go to the pharmacy, not the grocery store (though I did find gluten free crackers in a mini-mart in Rome.) 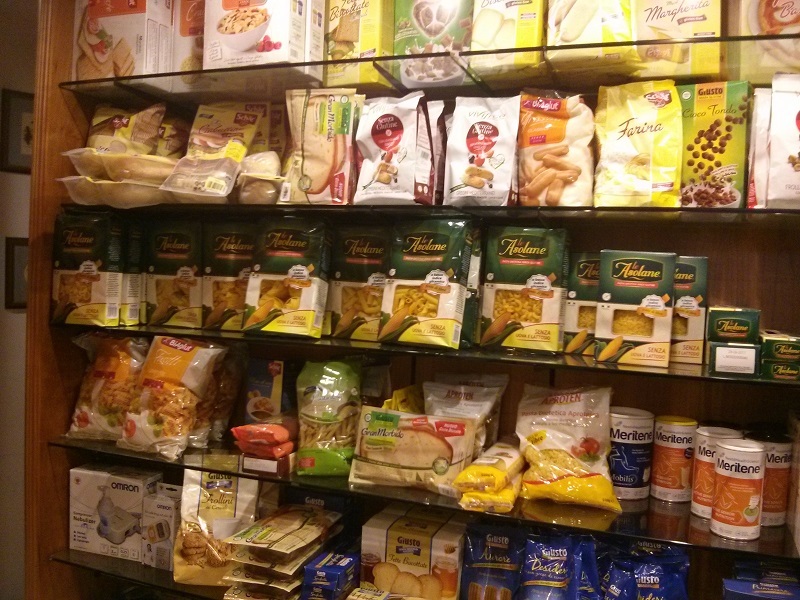 I went in a random pharmacy in Anacapri and was amazed at the wall of gluten free products – so many options. I bought some pasta to bring home. Unrelated to gluten, you should also know that sometimes the toilets don’t have seats – be ready to hover! This is true even in some ladies’ rooms, though I saw it more in shared public bathrooms. It wasn’t that big of a deal, but would have been good to know in advance. Have you been to Italy? Where should I go next time? I am still kind of bummed about missing Rome, but there’s a direct flight from Edinburgh and hopefully I’ll get to go back! Any tips on gluten free Italy?